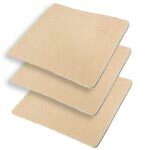 Molnlycke Lyofoam Max (4" by 4", part number 603201) is a polyurethane foam dressing that is soft, conformable and comfortable. It is designed to help manage moderate to highly exuding wounds, thanks to its high absorbency and fluid handling capacity. It can be worn longer, thanks to a reduced risk of maceration and leakage. Pack of 3 boxes (10 dressings per box).